Embattled IRS employee Lois Lerner waived her right to Fifth Amendment protections by presenting an opening statement, House Oversight and Government Reform Committee Chairman Darrell Issa (R., Calif.) said on Thursday. "She had counsel, she had sufficient time with counsel and she clearly waived," Issa told a group of reporters. "To be candid, my Democratic members were astounded, you didn’t hear any protest when I made it subject to recalling. There was nobody who argued with the point of order of Mr. Gowdy that in fact she had waived." Issa said Lerner will likely be called back to testify. "Our staff, our lawyers are working with her lawyer, and we’ll take it up after the short recess … all four witnesses are subject to recall," Issa said. "I think we expect that she’ll be back in front of the committee." 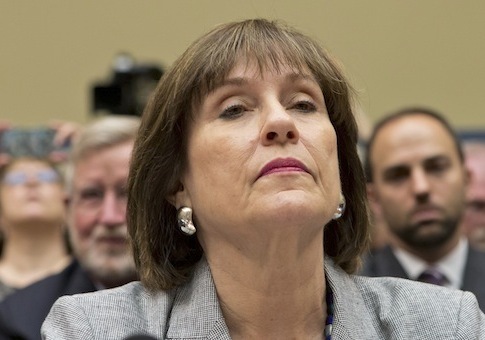 Lerner testified at Wednesday’s hearing, "I have not done anything wrong. I have not broken any laws. I have not violated any IRS rules and regulations and I have not provided false information to this or any other congressional committee." Rep. Trey Gowdy (R., S.C.) immediately took issue with the committee’s decision to let Ms. Lerner leave without answering their questions. "She just testified. She just waived her fifth amendment right to privilege," Gowdy said. "That’s not the way it works. She waived her right to Fifth Amendment privilege by issuing an opening statement. She ought to stand here and answer our questions." "We’re often chastised for ‘are you going to bring somebody there just to ridicule them,’ of course not," Issa said. "When someone says they’re going to take the fifth, you bring them, they take the fifth, you dismiss them." "She came, she chose to testify under oath, and then tried to assert," Issa said. "Rather than disrupt the other three, we continued without her so there’d be time for attorneys to argue this out." Congress will be in recess all of next week and return Monday June 3. This entry was posted in National Security and tagged Congress, Darrell Issa, IRS, Lois Lerner, Trey Gowdy. Bookmark the permalink. Ellison Barber is a staff writer for the Washington Free Beacon, where she pens a daily column "Ellison's Must Read of the Day" and a weekly "Sunday Show Roundup." As a reporter, she covers Capitol Hill. Ellison is a frequent guest on Fox News Channel, and Fox Business Network. She is a former contributor at The Blaze. She graduated from Wofford College, has great taste in music, and currently lives in Washington, D.C. Her twitter handle is @ellisonbarber.